This soup looks so fragrant and flavorful! MMMgood!!! We enjoyed it so much. It was requested for dinner again this week so looks like I’ll be making another batch. :) Love the creaminess of the coconut milk. Goes so well with the ramen noodles. Perfect for cooler weather! This looks delicious and I really appreciate the suggestions on how to make it your own… swap sausage for tofu, bok choy, etc. Yum!!! You’re right. 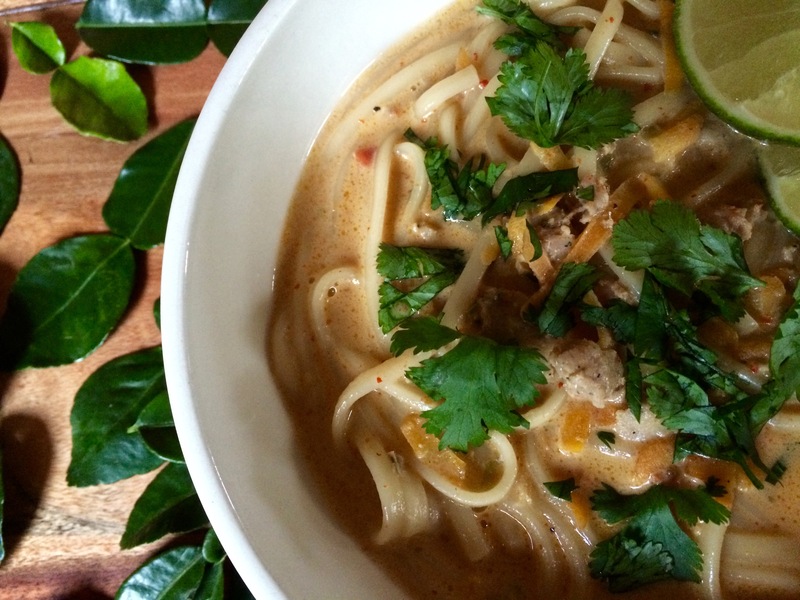 These cold and wet days are made warm and cozy with a bowl of these creamy noodles. And I love kaffir lime leaves. Have you had an opportunity to cook with them? Such unique flavor. Great to see your comment this morning! Have not cooked with kaffir lime leaves… do you use them often? In what other ways? Hi Seana, I love dishes like this, sounds like the perfect balance of flavors. I am back in Oregon and trying to grow lemon grass, we will see. Take care! Lemon grass would be wonderful in this. I thought about adding it and then when I saw the kaffir lime leaves I changed my mind. I guess both could be added. Lemon grass is a really neat looking grass, it’ll be great in your garden as well as your cooking. Good idea. Wow this looks so delicious! yumm I love new recipes like this one that I have never tried! Hi Lyn, you’d love this noodle dish. I can find most of the ingredients at our local market, except for maybe the lime leaves. Lemon grass would be a great substitute for it. The flavors in here are very unique. It looks so good! I love these flavors. Where would I find lemon grass? Is it easy to find? Ok I will see thanks!! I had left a comment hmmmm… well I will say it again, this recipe is saved. I love ramen, the soup looks so creamy and delicious simple to make but complex flavors. LOVE IT!! I actually love the idea of adding crispy tofu!! Yes, how strange! The last three blog posts I have published were problematic. They posted with a much earlier date which put the posts days behind in the reader. I had to go in and edit the date in order to bring it current. Argh. Thank you for leaving me another comment! :) And really, I’m looking forward to your autumn salad tonight! Your soup as well, need to stock up on a few things before hand. I have been looking at ramen bowl recipes the last few days! This sounds delicious! Nothing like a warm bowl of soup on these chilly fall days. That’s the truth! My soup cravings have gone up considerably these past two weeks. It’s been so chilly and wet. Hard to imagine it’s already November! I saw holiday decorations downtown Seattle this morning! This is lovely. I will post a chicken noodle soup next week. I was delighted with the flavours that I got from a very few ingredients. I can only imagine how delicious this is. Seana it looks like there are so many really distinct and powerful flavors in this bowl! I agree with you, there isn’t much better than this. I love it. It’s comfort food that transports you to what you imagine would be home if you lived elsewhere. Perfect. I really do love this. Oh man! This looks amazing. Would never have thought to add chicken sausage to a curry dish – great idea, and I know my boys would love it! Happy to make any recipe with fresh kaffir lime leaves – one of my favorite aromas. I keep mine in the freezer. Hi Sas! I have a Thai friend who adds sausage to many of her dishes, including curry and it goes so well. I actually prefer it to chicken breast. Great idea keeping the kaffir lime leaves in the freezer. I better go store my extras in there now! I love them too…so unique and flavorful. And I’m such a coconut fan…milk, oil, water, cream…such amazing food, isn’t it? Mmmm, so you can guess what I’m now craving for dinner tonight! 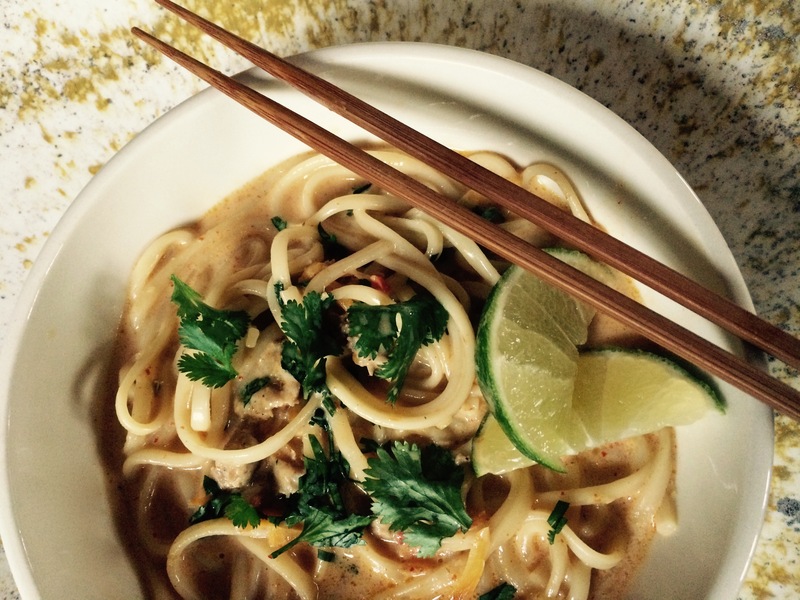 Absolutely adore these Thai flavours Seana… we really are on a similar wavelength with both coconut and lime this week. ;) Earlier this year I bought my own little potted kaffir lime tree to grow and recently with the warmer weather we’ve had it’s shooting out lots of new growth, which is very exciting. Such a beautiful fragrance and flavour! There’s a coincidence: because of one of Margot’s posts I bought dried lime leaves – which I still haven’t used (I’m hoping they’re kaffir). There are lots of wonderful flavours going on in your curry. I’ll have to start looking out for certain ingredients. Right now I’m lazily cooking lots of soups. Lazily cooking lots of soup sounds like my kind of cooking, especially now that we’ll be turning our clocks back this weekend. When it’s dark so early I start feeling a little less inspired to fuss around in the kitchen. Kaffir lime leaves don’t smell (or taste) like lime at all. I know you are keen on using bay leaves in your cooking, so I’m interested in hearing what you think of the flavor of lime leaves. Very unique. Enjoy the weekend! Heavy rain in our forecast! We used to frequent a noodle house here in Seattle several years ago (until it moved locations and was never the same) and I always ordered something very similar to this. I was delighted when it turned out so well. I’m wondering if kaffir lime trees will grow well in our climate. I’d sure love to have one. Good to hear Sandra, thank you. We have very mild temps here in Seattle. Hasn’t snowed in 6 or 7 years, and we usually only get a week of frozen temps in the winter. I’m going to try it! Hi Seana, this ramen sauce is amazing! I just came back from Tokyo and had a lot of ramen there. Coming from south-east Asia, you got to trust me that this is one ramen I’ve been dreaming of getting. Gonna give it a try! Warmly, Danny. This dish looks really, really good! All the flavors and seasonings in this sound great and I love that it has coconut milk in it, too! Looks lovely, just my style weekend food. I can almost taste it all the way over here in Finland. Looks really delicious! I am a huge soup fan of any kind. That’s funny, I had a blog friend offer me some Kaffir lime leaves just this morning! Hope you accepted your friends offer on the kaffir lime leaves! I think you would really enjoy cooking with them Kathryn. Such an unique flavor. :) Especially with coconut milk and curry paste. Your curry sounds wonderful. My husband has been sick and not wanting to eat for almost a week. I think this just might be something to entice him. Simple and beautiful– my kids are ferocious ramen eaters. I think they’d love this!! I’d like to think of myself as a ferocious ramen eater too, but then I’m sure there is a whole other level of ramen eating I am unaware of. :) I love that your kids love ramen…maybe you could prepare this one for them and see what kind of response you get! It’s fantastic! my kids are older than yours– (and my son-in-law and a daughter-in-law are both Chinese!) so they’ve taught me to like ramen! I thought your “in-laws” were Chinese! I’ve seen photo’s on your blog. :) I bet they have taught you to like ramen and I imagine they have some great spots to eat. They do– Ani & Brian live in San Francisco– and they are always taking us out for Chines, Korean, Burmese, Mayasian, Thai… food. I love going to the asian store.. it’s always fun to get aromatics like kaffir lime leaves. Definitely makes food extra special. This recipe looks great! mmm. . . It looks delicious. Perfect for the cold weather! I just snagged some lime leaves from the store and I can’t wait to use them! This dish looks amazing! You are calling my name here! I’m in love with this without even tasting it. Well, I guess I’m tasting in my mind!! Now I have my recipe for tomorrow. This sounds so delicious! Thanks for sharing. I love ramen, and I make them at home with varieties of broth flavor. Now I know another one to make. Yum! I would eat this soup immediately, it looks and sounds so delicious! Thanks for sharing. I hope you’re not ill. I miss seeing your blog posts. Perhaps you just haven’t had time lately. In any event, I sure do hope all is well with you. How kind are you Cecile! I have been extremely busy and plan on getting back to blogging this summer. Thank you so much for reaching out to me! Awesome!!!!!! Did you see my post today? I was about you … and I few others like you… fellow food bloggers whose blogs I miss soo much. I’m going to to an UPDATE and say that you’ll be back!!! ; o ) HURRAH!! I’m missing your posts– but I suppose you’ve taken up other things to fill your time! Are you out of school for the summer yet? Hope all’s well with you Seana… hugs from here. Hi Rhonda! Thank you so much for sending me a nice message. :) We are still in school until June 17th. Hopefully I’ll be back to blogging this summer. I’ve been incredibly busy, however, I really miss my friends in the blogosphere! Happy summer! Fall is just around the corner again and I cant wait ti try this recipe! LOVE ramen and perfect for the upcoming season! Hi Seana! I am going to make this this week. We recently moved to San Diego (did you know that?? Same summer as T, 13 years later!! ), and we again have access to Asian grocery stores :) I clicked over to your blog after a long time away and see you haven’t posted recently! Your meals always look so delicious and comforting and I was wondering what your everyday Monday dinner looks like right now (because I need ideas for this week!! )… Anyway, hope you are well. Can’t wait to make this! Just what I was looking for. Can you tell me what kind of curry paste you use? I’ve bought the one in a can and currently have one that comes in little tubes. 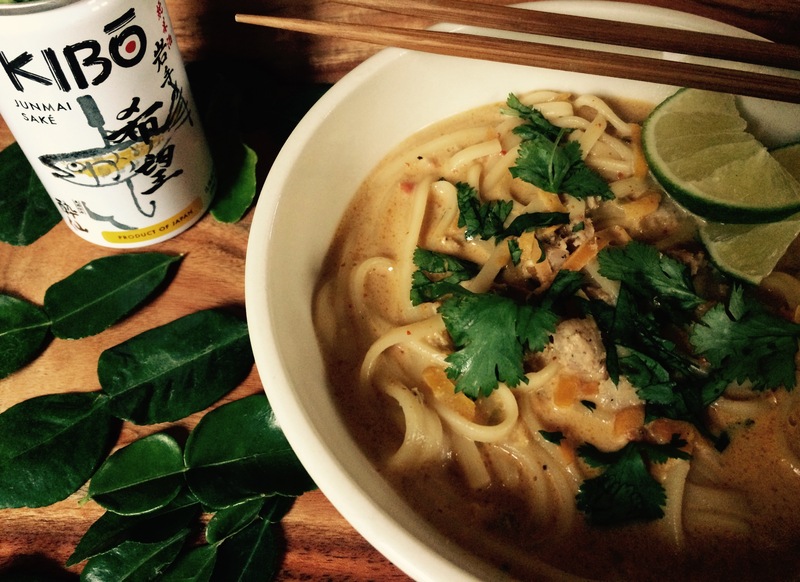 You are currently reading coconut curry ramen at COTTAGE GROVE HOUSE.